My local stamp club enjoys getting together every month to make projects, learn new techniques, and get Stampin' Rewards for their regular monthly purchases. Now YOU can enjoy the same benefits AT HOME -- no matter where you live in the United States! This Online Club allows you to choose the products you want to order each month, whether that's stamps or ink or big shot dies -- it's YOUR choice! Plus you'll learn new techniques and create new projects. Each month I split the collective Stampin' Rewards in the form of free gifts for everyone who orders $40 or more. Use the Host Code (shown at the top of this page) to qualify for Stamp Club AT HOME perks. I will send you the password to an exclusive web page where I will post three new projects with video tutorials and supply lists. If you order over $40 before tax and shipping, I will send you a free gift AND a free make and take packet with the supplies to make the Stamp Club AT HOME projects (as shown in the videos). (Limit one make and take packet per customer per month.) Make and Take Packets will be sent at the end of each month. 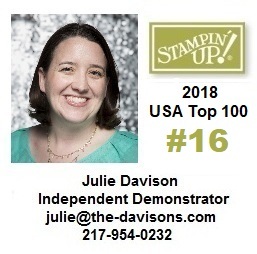 Julie's Stamp Club AT HOME is available exclusively from Julie Davison, Independent Stampin' Up! Demonstrator. If I order $150 or more, should I still use the Host Code? No. If you order $150 or more, you will qualify to receive Stampin' Rewards ($15 or more in free merchandise). I will still send you the free project kit and free gift! How/Where do I enter the Host Code? Go to my Online Store at http://juliedavison.stampinup.net and start shopping. Log in or create a Customer Account if you don't have one already. Start shopping. Once you select an item and add it to your shopping cart, you can enter the hostess code in the lower left corner. Once you have entered it, my name (Julie Davison) will appear as host. Is the Password for the Exclusive Project Page the same as the Host Code? You will receive the password to the exclusive project page ANY month that you order. You will also get the free gift and free make and take packet any time you order more than $40 at one time.